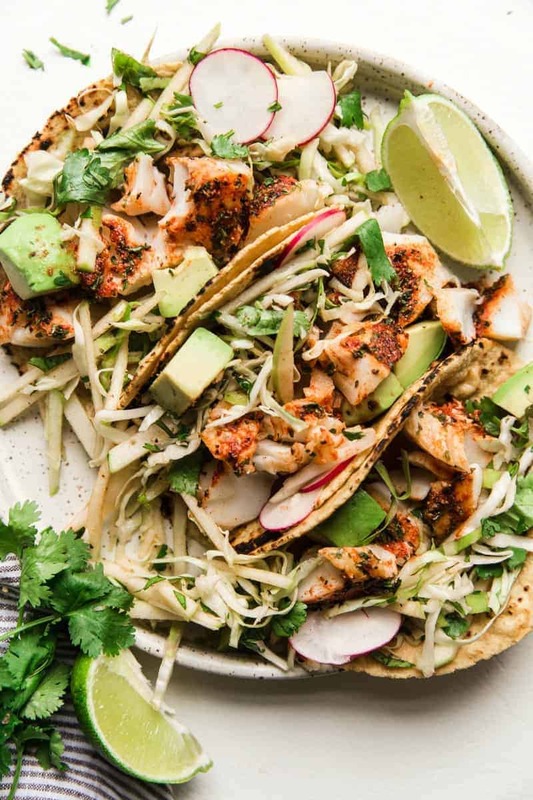 Light and Tasty Fish Tacos that are Healthy and Delicious! In a small bowl combine paprika, garlic salt, dried parsley and black pepper. Arrange fish on a parchment lined baking sheet and season generously with prepared spice blend, reserved ½ tsp of the blend for the slaw. Place on fish on center rack in oven and bake for 10 minutes. While fish is baking combine cabbage with apples, cilantro, onions, lime juice and reserved spice blend. While the fish is still warm divide between warm tortillas and top with apple slaw and fresh toppings.